Have you worked with yeast before? Are you intimidated or does it seem like too much work or are you worried you’ll just mess it up? Never fear, you are not alone. 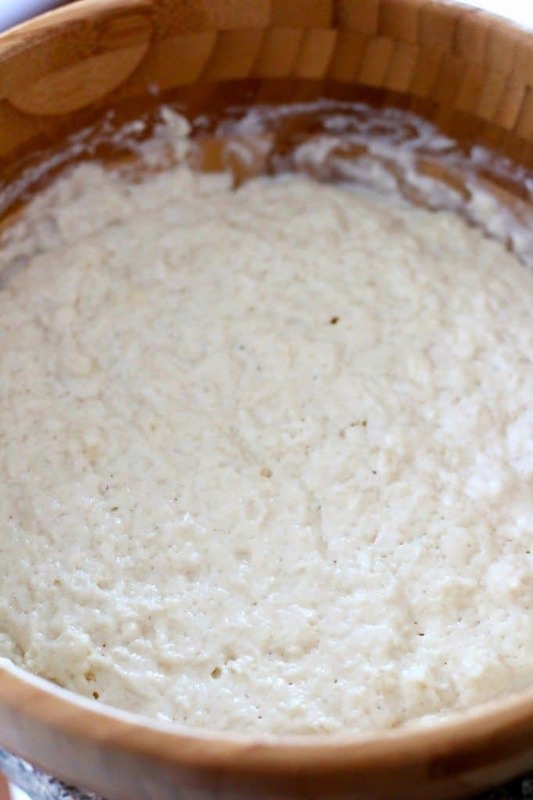 Yeast recipes, like making biscuits, is one of those things that folks either dive into or they don’t. But I’m here to tell you, you can do this and I’m going to give you a great intro. recipe to help you conquer that fear. Making anything with yeast is so much like making biscuits to me. You have to learn what looks and feels right and what doesn’t. Once you have that down, you will be a pro in no time. And you’ll feel tons more confident about making more things! 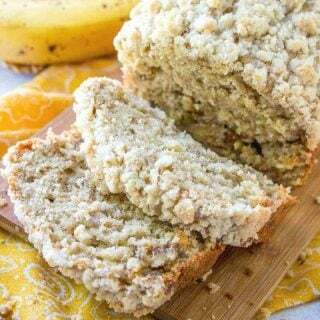 During the holidays is a great time to share that little something homemade for everyone when they wake up on holiday mornings! So, let’s start with a couple of basics with yeast. 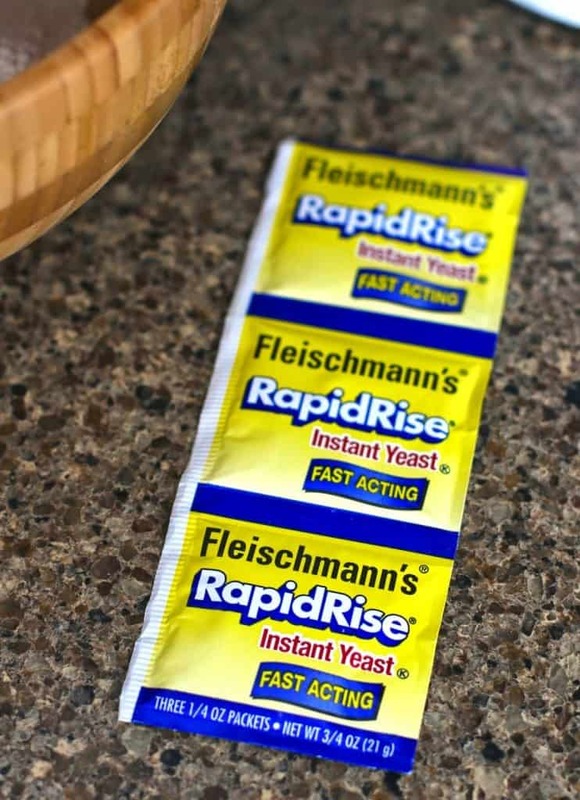 For this, I’m using Fleischmann’s® RapidRise® Yeast. This is your standard yeast but with a kick. It works a whole lot faster because you only let the dough rise one time. In some recipes (usually bread recipes), it is required you let the dough rise once, then shape it into whatever shape you want, then you let it rise again. That isn’t necessary with this particular type of yeast. You can buy yeast in jars and keep it in your fridge or you can buy it in these packets. 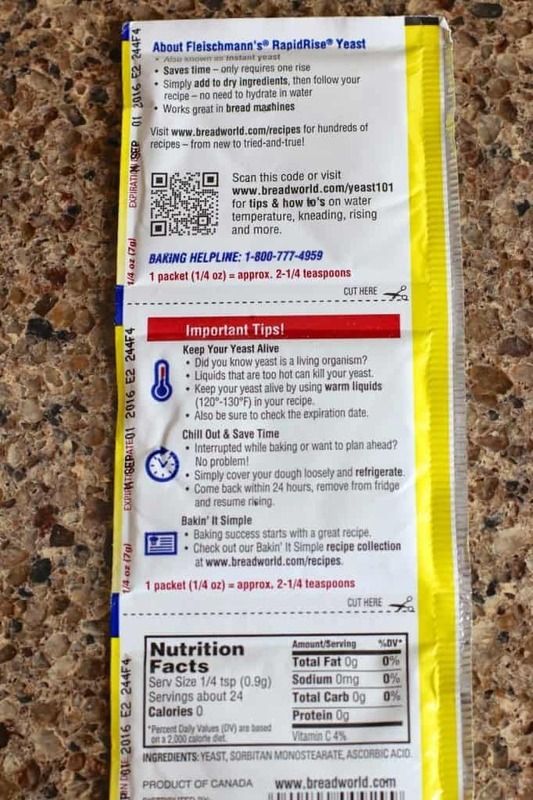 Almost all yeast recipes are designed to where you just use one of these packets per recipe. And if you are worried about using too much or too little, this takes a bit of that fear out of the equation because it’s already done for you. If you need a guiding hand, just flip the packet over. 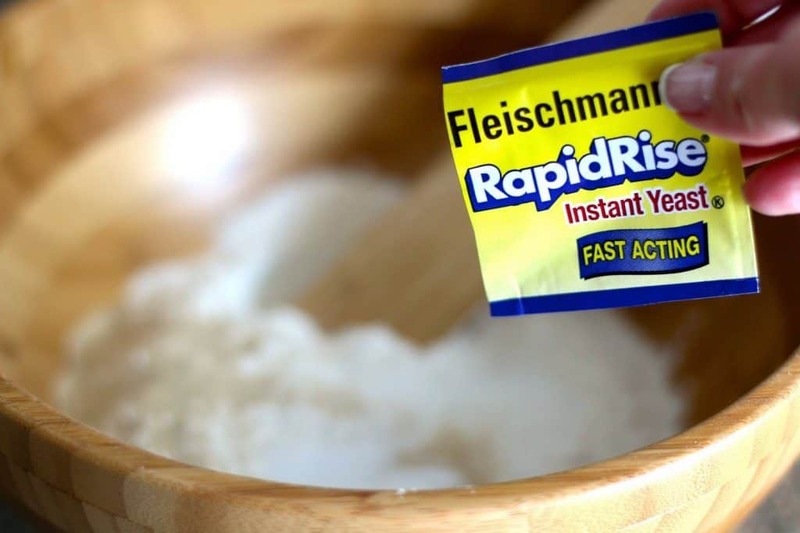 Fleischmann’s gives you a bunch of tips to help you along the way. You can even call someone if you need additional confidence. 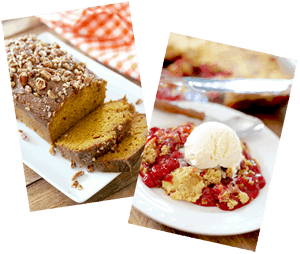 Or, just pop over to their website, www.breadworld.com to get recipes that are all divided into beginners to experts. I love those little tips in the middle there. For the longest time, I wasn’t sure if you could make something in advance, then pop it in the fridge. 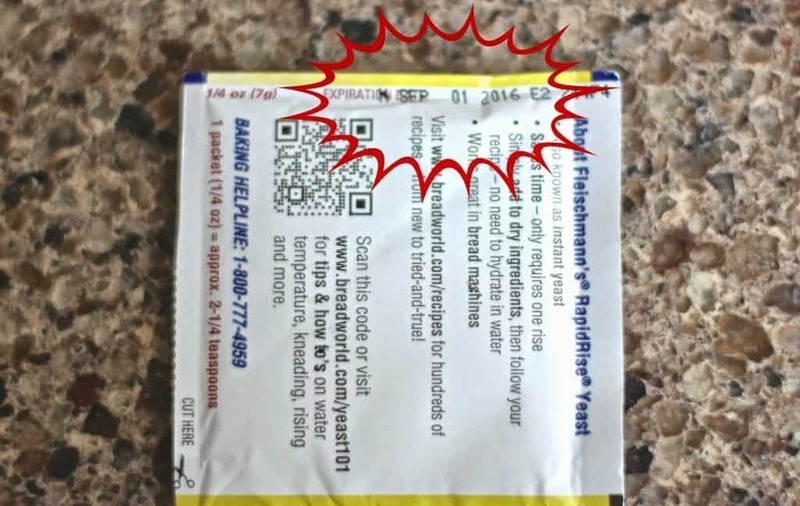 Or why my yeast didn’t activate (because I was using boiling milk!) Got that handy little tip from Fleischmann’s website. It’s also where I got this recipe! So, first things first, check the expiration date on the packet. Expired yeast is not like expired spices. Expired yeast just won’t work – at all. At least with expired spices you can take a leap of faith. Yeast is a living thing and therefore it has some requirements to be happy. The first requirement, it needs food. Food for yeast is sugar. Sugar makes yeast very happy. So any recipe with yeast will always have a bit of sugar of some sort in the recipe. The second requirement? Heat. Yeast likes to be warm and cozy. Not boiling or scalding hot, but very warm. Between 120F-130F degrees. Basically, you want whatever liquid you are adding to the yeast to feel very warm to the touch, like a heating blanket, but not so hot that it burns when you dip your finger in. So we have good yeast, we got sugar to feed it and we will be heating up the milk in just a minute. We’re all set to make something! 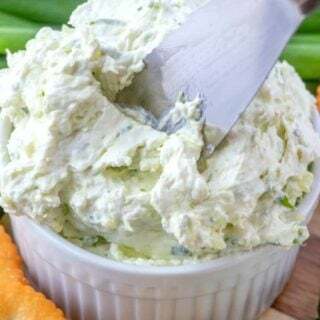 This is a great beginner recipe because it is very forgiving and you can play around with it a bit if things don’t go exactly right. Combine flour, sugar, packet of dry yeast, salt and baking soda in a large mixing bowl. 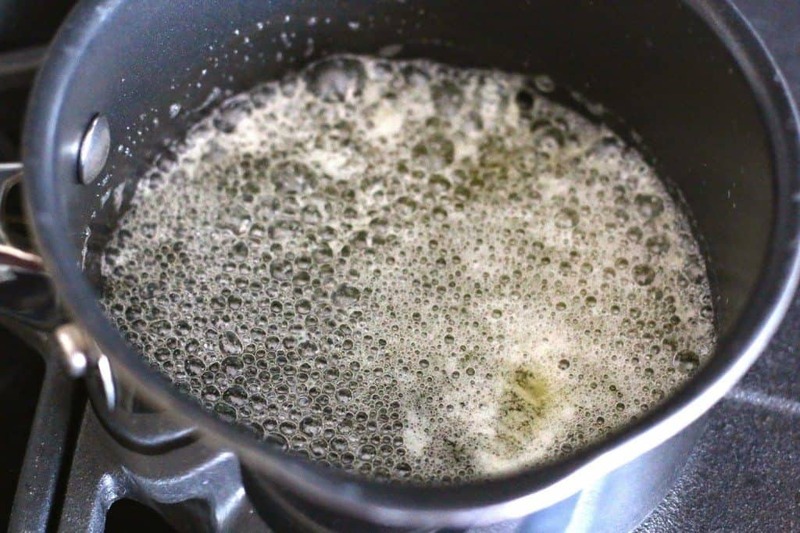 Combine buttermilk and oil in a separate, microwave-safe bowl. Microwave on high in 15 second increments until thoroughly warm to the touch (120F to 130F degrees) – not boiling. Boiling the milk will kill the yeast. *So let’s pause and talk for a minute about the differences between real buttermilk and sour milk. Real buttermilk is thick and it’s sour tasting. Sour milk is regular milk that has had something sour (lemon or vinegar) added to it and is not as thick as real buttermilk. Most folks learn that you can add some sort of acid to regular milk and you easily make a buttermilk substitute. Well, that’s true in many cases but it doesn’t make your 2% milk magically thicker. And you have to compensate for the difference in thickness. First of all, don’t use skim milk or any kind of milk substitute. Ever. It just doesn’t work. You need fat to make this work. I wouldn’t use anything less than 2% cow’s milk. Whole milk is best if you got it since it closely matches the thickness of buttermilk. 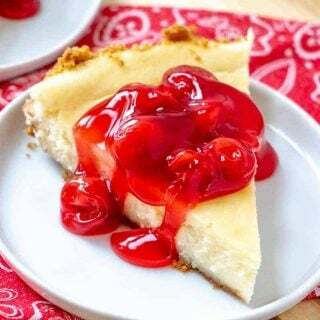 So, if you are going to sour some milk, you will need to add about 1 tablespoon of lemon juice or vinegar to every one cup of 2% or higher milk and let it sit for about 5 minutes – then stir. Again the thickness will not be the same and that does affect the thickness of this batter. 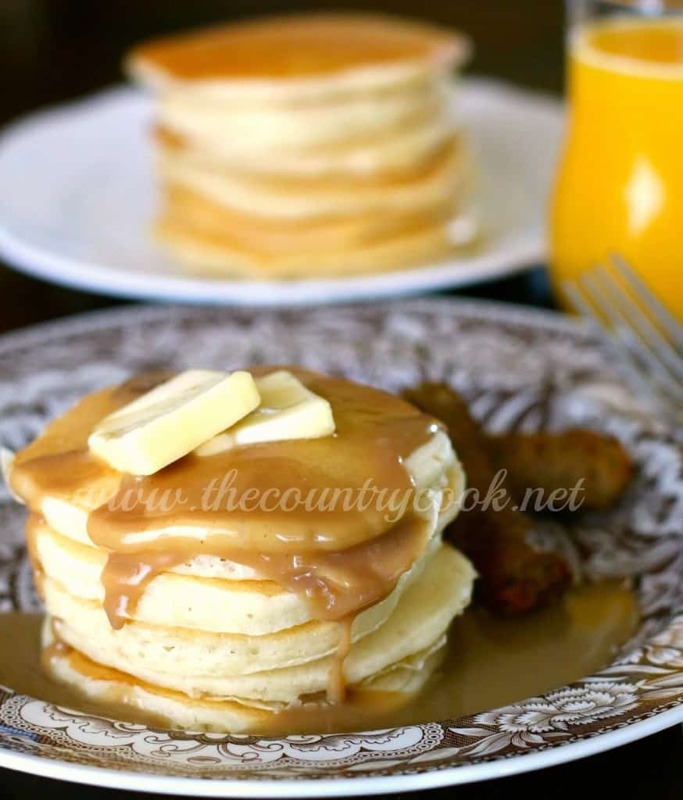 If you are using real buttermilk, be prepared to heat up a bit extra to have on standby in case your pancake batter is too thick after mixing. 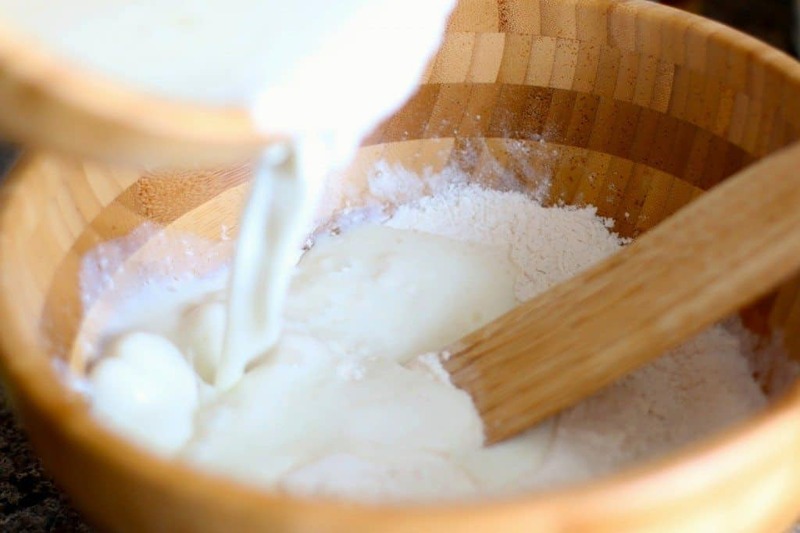 Add your heated milk to your flour mixture, along with your beaten egg and vanilla extract. 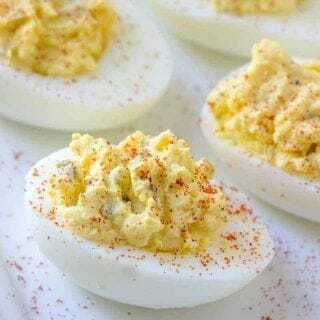 What is a beaten egg? 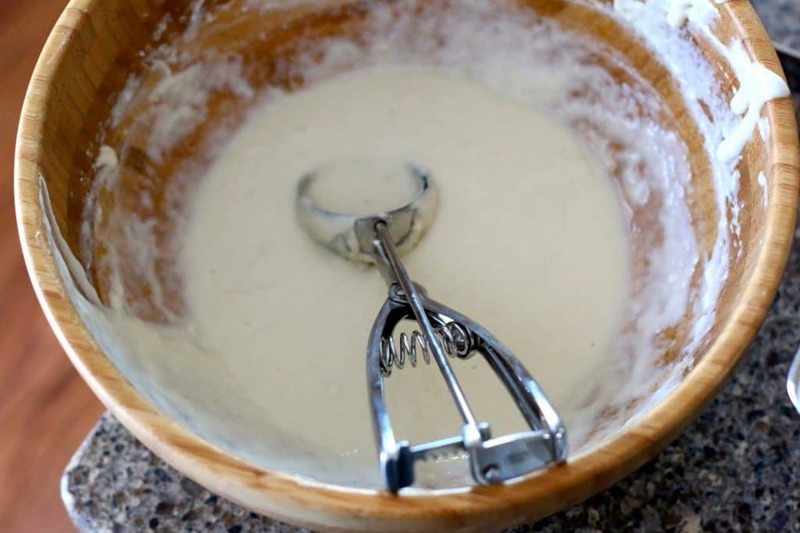 It just means you crack the egg in a separate bowl, give it a good whisk with a fork, then add it to your batter. Stir everything together but be gentle. 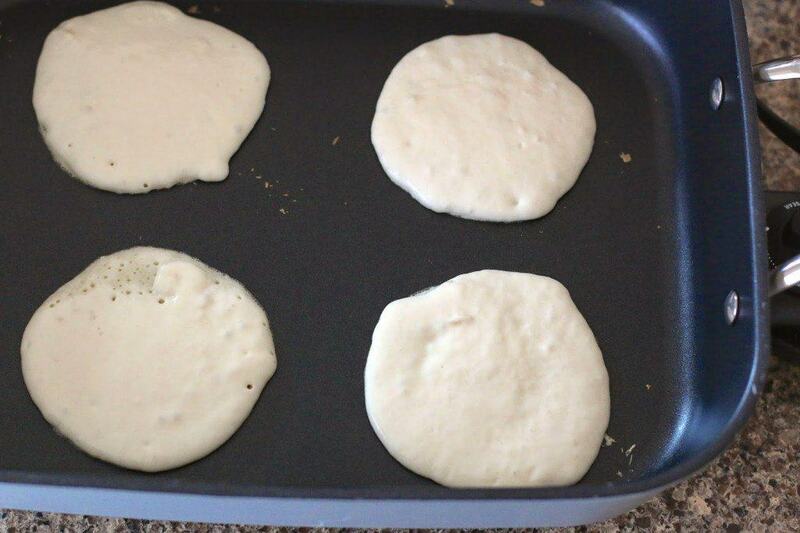 Pancake batter is supposed to have lumps. The more you mix and stir, the tougher the pancakes will be. This has something to do with overworking the gluten in the flour. I’m not sure about all the science on that one. But just know, you can live with the lumps and your pancakes will be better for it. *Side note: As I mixed this up, I noticed my batter was really thick. I was using real buttermilk here. It was thick like brownie batter and that’s too thick. 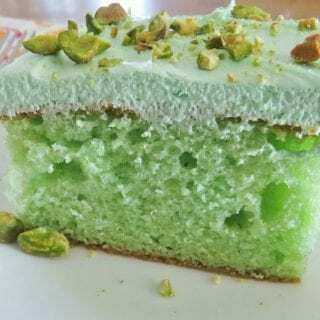 You want it to be more like a cake batter consistency. So I heated up about another 1/3 cup of buttermilk and added it to the batter to thin it out some. It worked perfectly! 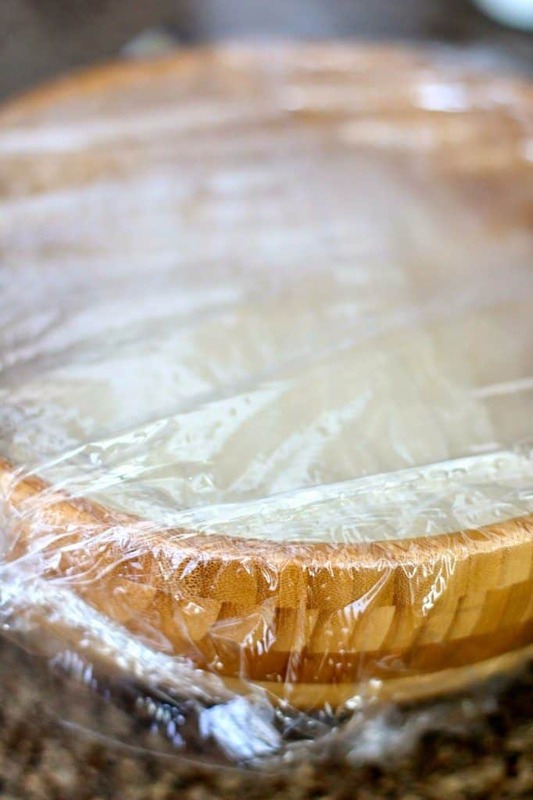 Now, cover your bowl with plastic wrap or a dish towel and set it someplace warm so that the batter can rise for about 10-15 minutes. You should see it almost double in size. Remember, yeast likes warmth, not cold. Once you’ve noticed the batter has doubled in size and is looking “bubbly”, start heating up your skillet or griddle to medium-high heat. I use a nonstick electric skillet. It’s easier to keep the temperature under control and I can make about 4 pancakes at a time. Plus, no oil or nonstick spray needed. If you are using a skillet or pan that isn’t nonstick, be sure to spray some nonstick spray or rub it with oil before making your pancakes. See those bubbles up there? Bubbles are good. Bubbles show that your yeast is happy and doing its’ job. Stir down the batter gently. You are just releasing all those air bubbles that have been created by the yeast. Then it’s time for the fun. I like using these little spring-release cupcake scoops to get just the right amount. We don’t make huge pancakes, but if you want, go for it! This scooper holds 1/4 cup of batter so if you have a 1/4 cup measuring cup, just use that if you don’t have one of these. 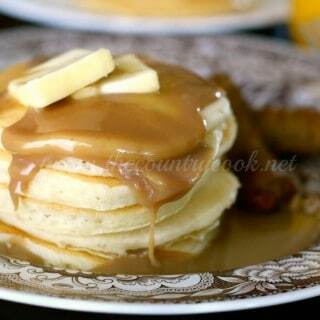 Pour 1/4 cup of batter per pancake onto griddle or skillet. 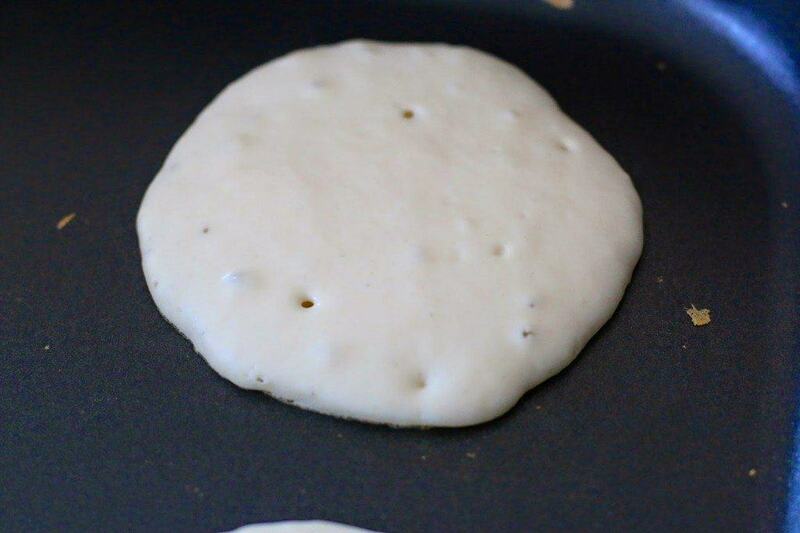 Cook pancakes until edges are dry and surface is bubbly. These are your indicators that the pancakes are ready to flip! Bubbles are good here too! Just look until you see that the edges are getting dry. Dry edges mean you will be able to flip them easier and that side is done cooking. Using a flat spatula, begin flipping them over and they should be nice and golden brown. Cook the opposite side until golden brown and then work on your next batch. 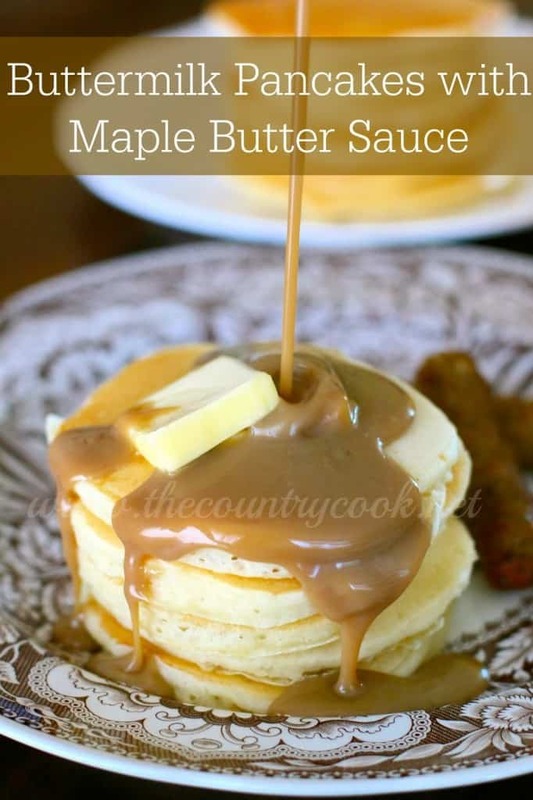 Serve with some warm maple syrup and butter. See how fluffy they are? They puff up so nicely and cook so evenly! Now you have a base recipe that you can add to. Add in blueberries or chocolate chips for a new twist! 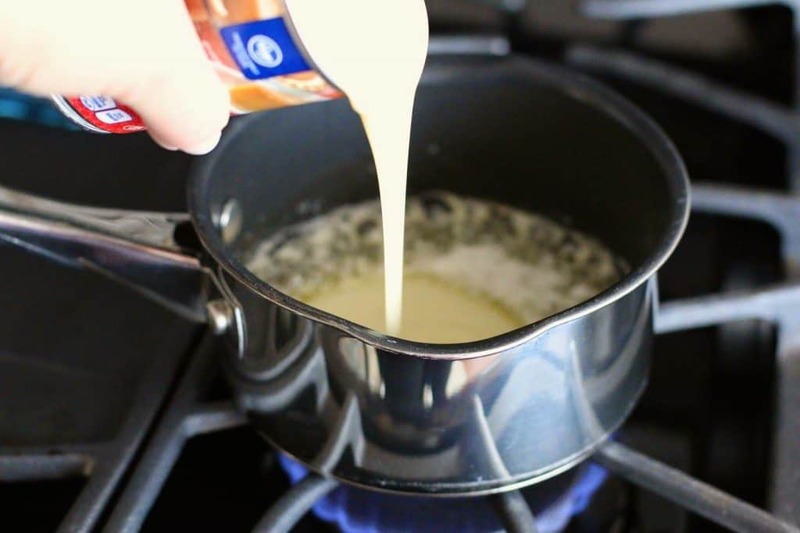 But, if you really wanna go all out, you have to make this simple maple butter sauce – so good! In a small pan over low heat, melt butter. I got a little crazy with the heat and mine started bubbling. This is what happens when you are trying to take pictures while you cook. We don’t want burnt butter here, so gently melt the butter. Then pour in the can of sweetened condensed milk and the maple extract. Whisk well. It will take a minute or two to incorporate that flavoring with the rest of the ingredients. Once it’s ready and heated through. Put it into a glass pouring dish (I just use my Pyrex measuring cup) and pour over warm pancakes. Mmmmmm. 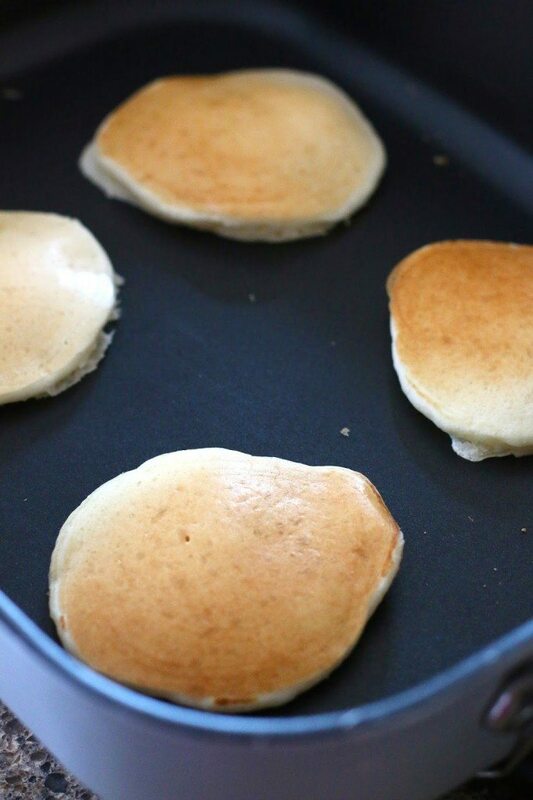 Cook’s notes: Did you know you can freeze any leftover pancakes? I never let any batter go to waste. It comes in handy during busy weekday mornings. Just make up the rest of the pancakes with the batter. Then line them up, in a single layer, on a baking pan or cookie rack then put them in the freezer for about 20 minutes. This is called flash-freezing. Once they are firm and cold to the touch, you can then put them into a freezer-safe bag without them sticking to each other. 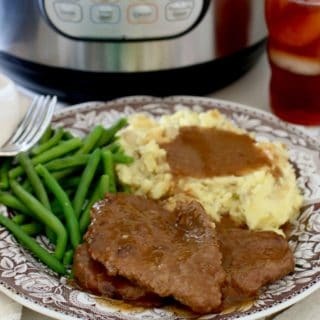 Just reheat in the microwave for a few seconds when you are ready to serve them again! 1 oz can sweetened condensed milk 14 . 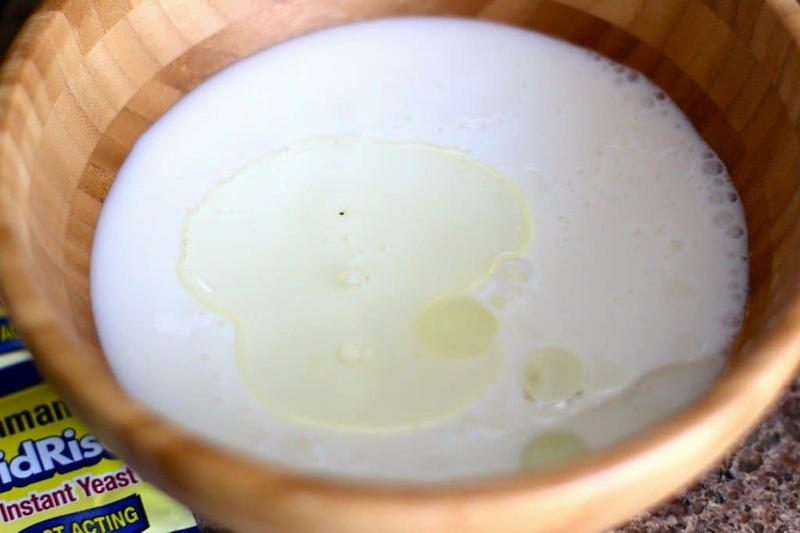 Combine buttermilk and oil in a separate, microwave-safe bowl. Microwave on high in 15 second increments until thoroughly warm to the touch (120F to 130F degrees) - not boiling. 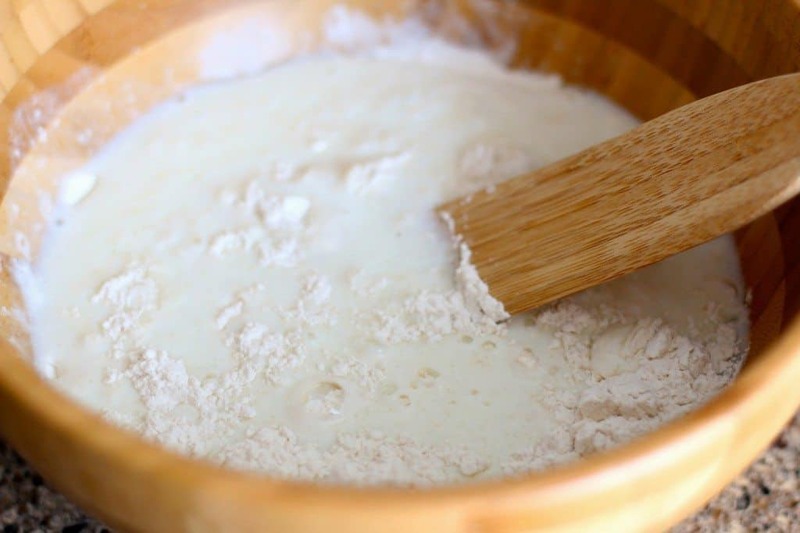 Add your heated milk to your flour mixture, along with your beaten egg and vanilla extract. Stir everything together, but be gentle. Pancake batter is supposed to have lumps. If batter is too thick, add in a bit more heated milk. It should be the consistency of cake batter not thick brownie batter. Once you've noticed the batter has doubled in size and is looking "bubbly, start heating up your skillet or griddle to medium-high heat. If you are using a skillet or pan that isn't nonstick, be sure to spray some nonstick spray or rub it with oil before making your pancakes. 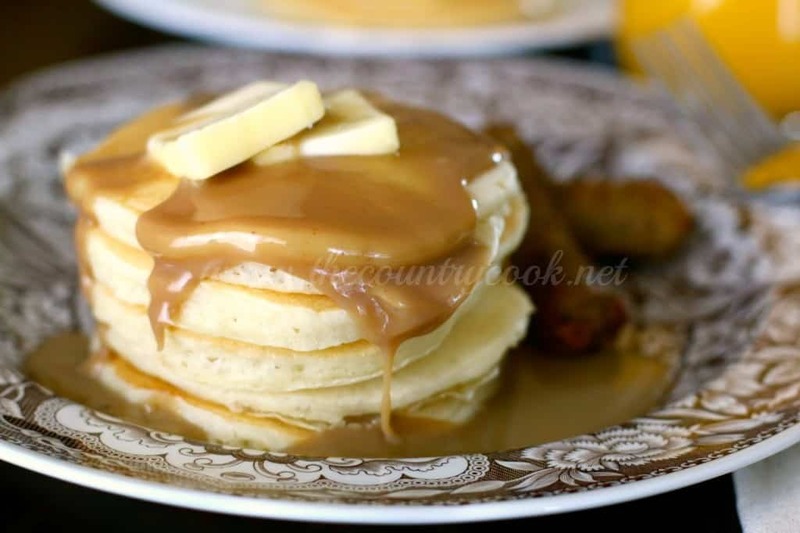 Pour 1/4 cup of batter per pancake onto griddle or skillet. 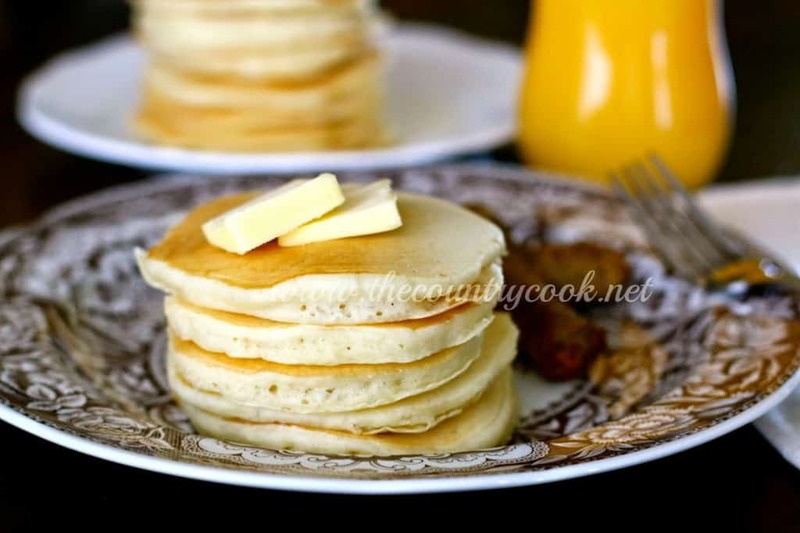 Cook pancakes until edges are dry and surface is bubbly. These are your indicators that the pancakes are ready to flip! Bubbles are good here too! Just look until you see that the edges are getting dry. Dry edges mean you will be able to flip them easier and that side is done cooking. Using a flat spatula, begin flipping them over and they should be nice and golden brown. Cook the opposite side until golden brown and then work on your next batch. 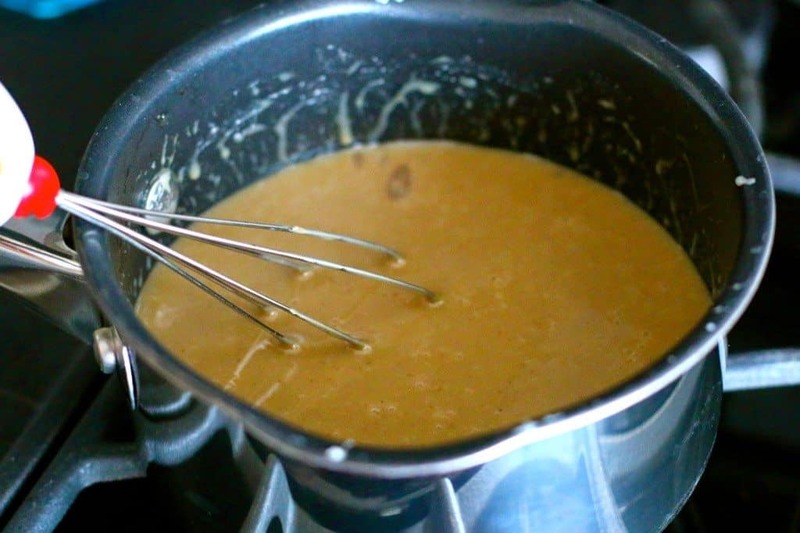 For the maple butter sauce: In a small pan over low heat, melt butter. Then pour in the can of sweetened condensed milk and the maple extract. Whisk well. It will take a minute or two to incorporate that flavoring with the rest of the ingredients. Once it's ready and heated through. Put it into a glass pouring dish (I just use a glass measuring cup) and pour over warm pancakes. Did you know you can freeze any leftover pancakes? I never let any batter go to waste. It comes in handy during busy weekday mornings. Just make up the rest of the pancakes with the batter. Then line them up on a baking pan or cookie rack then put them in the freezer for about 20 minutes. This is called flash-freezing. Once they are firm and cold to the touch, you can them put them into a freezer-safe bag without them sticking to each other. Just reheat in the microwave for a few seconds when you are ready to serve them again!